Cutting-edge maintenance trains to keep Elizabeth line running smoothly - Crossrail . For information about the Elizabeth line please visit the Transport for London website. New state-of-the-art maintenance trains that will be used on the Elizabeth line, to help keep it running for hundreds of thousands of Londoners and visitors, are being tested in Europe ahead of delivery to London later this year. A new rail milling train and two multi-purpose engineering trains with bespoke machinery attachments will be delivered to London ahead of the Elizabeth line opening in December. While London sleeps, these trains and their workers will be wide awake using the latest in railway technology to deliver the high levels of monitoring and maintenance that Transport for London (TfL) will require for the Elizabeth line. Investing in this cutting-edge technology will reduce maintenance costs for the brand new railway infrastructure, providing savings for many years to come. The 48 metre long rail milling train is the first of its kind to be used in the UK rail industry. It is able to scan the rails using electromagnetic crack detection, looking for any defects. If it identifies any issues with the track, it can mill the surface of the rail to remove defects and cracks, reducing wear on the new Elizabeth line train wheels and the tracks. Metal chips will be collected in a container on the train and later recycled as high quality scrap metal. The milling process eliminates the problems of sparks, fire and dust created by traditional rail grinding trains, leaving a smoother surface that will provide a quieter, more comfortable ride for passengers. Using this state-of-the-art technology will reduce the need for major track maintenance, meaning less disruption for customers. Manufactured by Austrian company Linsinger in Steyrermühl in Austria, it has two drivers’ cabs and space for up to four members of staff as well as a welfare facility. 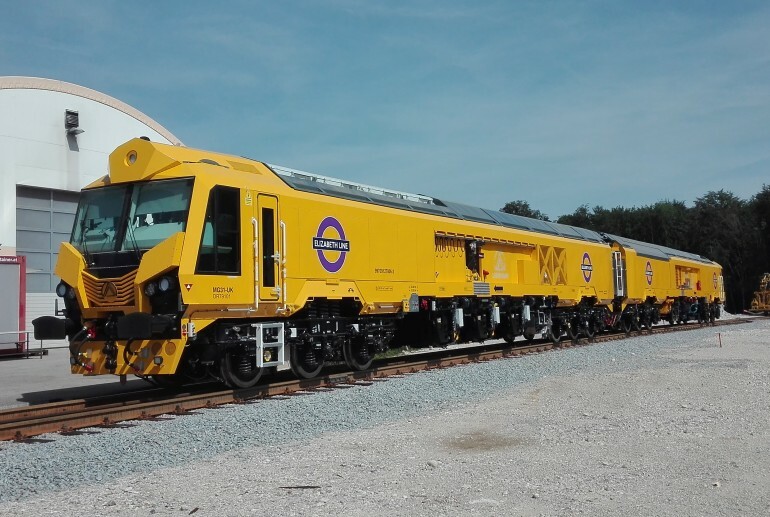 The two multi-purpose engineering trains, supplied by Plasser UK, have been manufactured by ROBEL Bahnbaumaschinen in Freilassing in Germany. They can be configured to be between 40 and 80 metres long, depending on the task, with a number of modular attachments. The trains’ unique gantry system, provides the capability to change a five tonne, 35 metre switch rail within the short overnight engineering hours. The trains can also be configured for different purposes using cranes, a scissor lift for working on overhead line equipment or cabling, and a water tank and jet for drainage clearance and tunnel cleaning. All three maintenance trains are fitted with the Elizabeth line’s new central section signalling system, enabling them to move around the railway while passenger trains are still running to maximise the time spent working during the night. Howard Smith, Operations Director for the Elizabeth line, said: “Complex monitoring and maintenance will be needed on the new railway and these state-of-the-art vehicles will help us meet those needs. The Elizabeth line and its customers will rely on the track and tunnel infrastructure being maintained while they sleep to ensure we can keep London working and growing. The Elizabeth line project is jointly sponsored by the Department for Transport and TfL with additional support provided by London's business community. Construction of the Elizabeth line is now in its final stages with a huge effort underway to complete and commission the new railway. Testing of the new infrastructure continues alongside the remaining fit-out of the stations. These new maintenance trains will ensure that tunnels, track and other equipment can be maintained for years to come. More photographs are available to download from the Transport for London Flickr site.